Euxton Villa slipped to their first defeat in four games as a Jack Woods strike 15 minutes before the end sealed the three points for mid-table Burnley United. 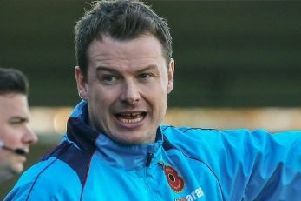 Mark McDonnell’s side had been producing much-improved performances of late but the East Lancashire outfit were the better side on the day and deserved all the three points. After a goalless first half, Oliver Wood gave Burnley the lead after 50 minutes. Villa substitute Danial Hogg drew the sides level on the hour mark before Brooks beat home keeper Shaun Gibbs to seal the away side’s victory. The defeat leaves Villa fifth in the West Lancashire League Premier Division table. Groundsman Hugh MacKinnon deserves all the plaudits as his tireless work ensured the game went ahead. But the Villa groundsman worked tirelessly to ensure that the game would go ahead. The home side made a confident start to the game, with former Bamber Bridge striker Greg John stone having an early opportunity. Skipper Rick Wood then shaved the outside of the post from a corner while keeper Gibbs made a fine save pushing the ball wide of the goal from a 25-yards strike. half-time, but early in the second half Burnley took the lead as Wood converted comfortably past Gibbs. Villa responded and Hogg made an instant impact from the bench, showing a burst of pace before slotting past the goalkeeper. Johnstone and Hogg both missed further chances before Woods converted from six yards after the Villa back line were caught out. Villa continued to press but Burnley defended well to seal the points. n A spirited performance from Dave Haughton’s Coppull United saw them claim the points on their Premier Division trip to the coast at Fleetwood Hesketh. Both sides failed to break the deadlock in the first half . But an action-packed second half saw United run out 4-2 winners. Danny Fisher gave Coppull the lead after 50 minutes before Simon Hill drew the sides level five minutes later. Former Wrexham and Preston North End midfielder Nathan Fairhurst then put the visitors in front before the prolific Mitch Leece added to the tally with just under 20 minutes remaining. Coppull were kept on their toes as Mike Brown pulled a goal back for Hesketh. But the comeback was shortlived as Leece scored his second and Coppull’s fourth to seal the points. n Charnock Richard were without a game as Norcross and Warbreck dropped out of the league before the season. n This Saturday, Euxton Villa travel to Slyne with Hest while Charnock Richard host Coppull United.